Kay Kenyon is the pen name of Katherine Kenyon Overcast. She majored in English literature at the University of Minnesota and went on to graduate studies at the University of Washington, hoping to become a writer. She worked as a model, an advertising copywriter, and an urban planner, which may have informed the worldbuilding in her science fiction/fantasy works. Her first novel was The Seeds of Time (1997). 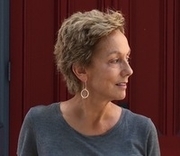 She published six stand-alone novels before embarking on a four-volume series called The Entire and The Rose: Bright of the Sky (2007), A World Too Near (2008), City Without End (2009), and Prince of Storms (2010). About a dozen of her short stories have been published in anthologies. Her work has been translated into several foreign languages. She lives in Wenatchee, Washington, and chairs the Write on the River writers' conference. Kay Kenyon is currently considered a "single author." If one or more works are by a distinct, homonymous authors, go ahead and split the author. Kay Kenyon is composed of 2 names. You can examine and separate out names.